Spanish painter. He was an outstanding figure in decorative Baroque art. When quite young he moved from Andalusia to Madrid, where he apparently worked with and was influenced by Francisco Rizi. 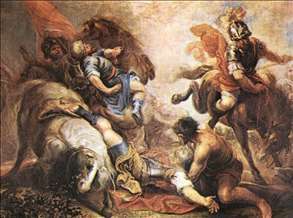 His artistic development reveals an increasing admiration for Veronese, Tintoretto and Titian, although elements of the style of Alonso Cano persist. Among his first works is Andromeda and the Dragon (c. 1659; Madrid, Prado), whose mannerist elements derive from an engraving of the subject by Agostino Carracci. The two brilliant works St Catherine of Alexandria (Madrid, Las Maravillas) and Road to Calvary (Museo de la Real Academia de San Fernando, Madrid), signed and dated 1660, are executed with an agile and self-assured technique, in colours that stem from Venetian painting. 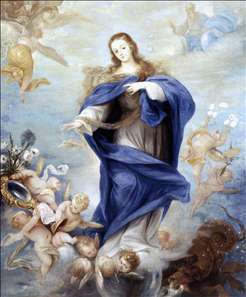 Like other Spanish painters of the period, he painted numerous versions of the Immaculate Conception (e.g. 1660, Colegio de Villafranca de los Barros; 1663, Budapest, Museum of Fine Arts; c. 1666, Benedictine monastery of Lumbier, Navarre), which are more Baroque in style and expression than those of Jos Antolnez and Mateo Cerezo. In these the faces, surrounded by luxuriant hair, is expressed an innocent candour that contrasts with the turbulent appearance of the cherubs. Also characteristic of his style are the versions of the Annunciation (1653; New York, Hispanic Society of America; Bziers, Muse des Beaux-Arts). He treated the theme of St Joseph with great nobility, as in the Dream of St Joseph (1666; New York, Chrysler Collection). His deep lyrical feelings pervade the various paintings of the Infant St John (Madrid, Prado). 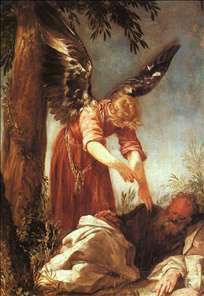 See more details about "An Angel Awakens the Prophet Elijah"